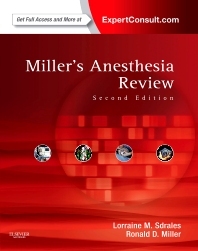 Prepare yourself for your exams with Miller's Anesthesia Review, 2nd Edition. Packed with hundreds of challenging review questions and answers, this essential study guide is an ideal way to assess and enhance your mastery of the information you need to know, and familiarize yourself with the complete range of essential topics in anesthesia. Easily assess your understanding at any level with chapters that progress from basic to advanced topics. Review the complete range of essential topics in anesthesia, from physiological and pharmacologic principles through anesthetic machine systems, anesthetic delivery in a variety of settings, and anesthesia administration for a full range of disease states. Get immediate feedback with detailed answers to each question at the end of every chapter. Prepare with confidence using the only review source based on the two globally respected anesthesiology references by Dr. Ronald D. Miller.